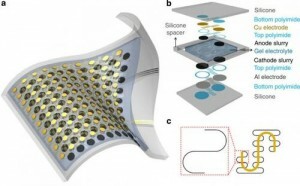 The move toward flexible electronics is the next step in the evolution of miniaturized electronic devices. Such devices would have an effect on the development of medical applications (such as prosthetics) and even consumer-directed wearable technology. Of course, these bendable electronics need an equally bendable power source. We’ve already seen work on a battery that used a liquefied electrolyte to provide the much-needed malleability. Now researchers from Northwestern University and the University of Illinois have revealed work on a lithium-ion battery that can stretch up to three times its original size. Yonggang Huang of Northwestern has been working with John A. Rogers of the University of Illinois for the past six years on the design of stretchable electronics with cordless power supplies (registration required). They’ve already demonstrated the feasibility of bendable circuits that use metal wire “pop-up bridges” to connect the circuit elements. However, this clever design is not suited for battery applications, since battery elements need to be tightly packed to store enough energy in a given volume. To tackle the problem, the researchers laid out fine electrode disks on a thin silicon substrate sandwich. Long, wavy metal wires were used as interconnects between the battery’s electrodes. To achieve optimal stretchiness, the metal wires had to be of a self-similar design: The wires in between individual electrodes form an S-shape, and each individual wire has many smaller S-shape waves within it. In a press release, the researchers call this a “spring within a spring” mechanism. Stretching it produces an ordered unraveling until the wires between the electrodes become taut. In addition to its flexible design, the battery can be recharged wirelessly through the integration of stretchable induction coils. Preliminary tests have shown the battery can power an LED during a full stretch for up to nine hours, and it can maintain its energetic capacity for 20 recharge cycles. Much work remains to be done, including the redesign of the wire geometry to produce a higher-density battery element packaging. If successful, the new battery would enable the use of wirelessly rechargeable implants anywhere on the human body. Just imagine a prosthetic elbow powered by a stretchy battery. Other uses may include brain wave analysis, heart activity monitoring, and wearable electronics that can monitor physical performance for both athletes and patients.